Middle Eastern flavors shine in this simply summery zucchini, bell pepper, and halloumi panzanella. I’m OFFICIALLY officially ready to eat like it’s summer. That means buying all the zucchini at the store and pretending I harvested them myself and OMG ISN’T IT SO ANNOYING HOW FAST AND ABUNDANTLY THEY GROW?! That also means Keeping It Simple. Basically, taking over my mother’s patio as often as possible without becoming an inconvenience, because OUTDOOR EATING. It’s the new black. The best part about outdoor eating is really that you can just keep it casual. No one expects you to break out the good China and real silverware to eat on your deck. So long as there is good wine, good food, blue skies, and a warm breeze..everyone is happy. I can’t control the weather (though I try!) but I can help you on the food and drink front. Starting with this salad. It’s all fresh flavors and fried cheese bits and crusty bread cubes and the perfect spicy harissa vinaigrette…and KALE. Dressed in Middle Eastern spices like lemony sumac and earthy za’atar, it’s also a mouthful of flavor. I love that in a salad. Then, there’s the WINE! 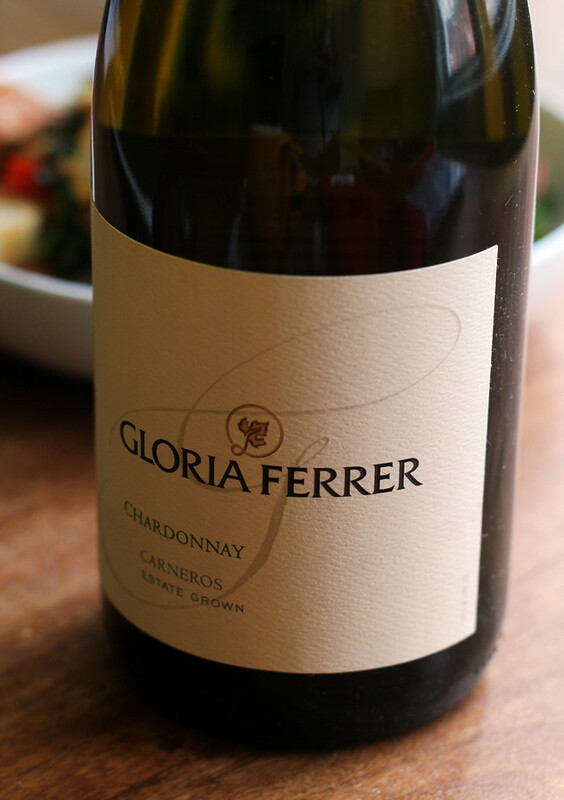 And not just any wine…Gloria Ferrer 2013 Carneros Chardonnay. You know, the good stuff. It’s fruit-forward, exuberant and pretty much perfect for pairing with just about any cuisine. The winery itself opened in 1986 and in the past 5 years alone, it has won over 400 GOLD MEDALS for its wines. That should pretty much speak for itself…but I’ll also say that I couldn’t wait to get home from work every day to pour myself another glass. Gloria Ferrer is currently hosting a Spring Photo Contest for anyone who wants to #BeGlorious! The theme from June 1st to June 15th is Al Fresco Dining/Entertaining and the winner will win a fun food and dining package! There are more contest themes through July 15th, so if outdoor eating isn’t your jam then it’s totally worth checking out to see if you can swing an entry that will fit for another theme. 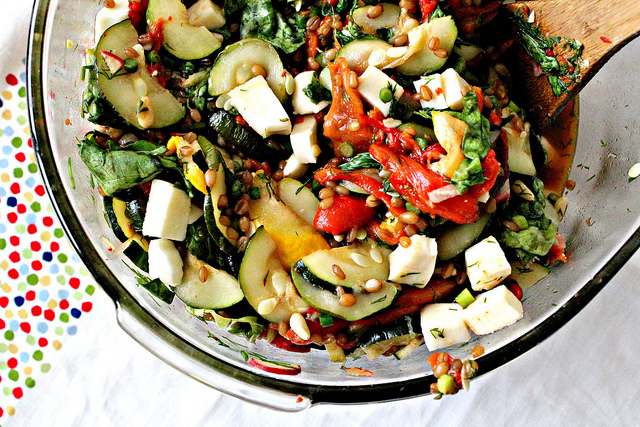 Middle Eastern flavors shine in this summery zucchini, bell pepper, and halloumi panzanella. Arrange bread cubes on a parchment-lined baking sheet in a single layer. Roast for 10 minutes or until crispy and starting to brown. Set aside. Heat two tbsp olive oil in a large skillet over medium heat. Add the halloumi to the pan and saute until browned on each side, about 4-5 minutes. Remove to a paper towel-lined plate to drain. Heat the remaining two tbsp olive oil in the same skillet over medium heat. Add the garlic to the pan and saute for 1-2 minutes, or until fragrant, stirring frequently. 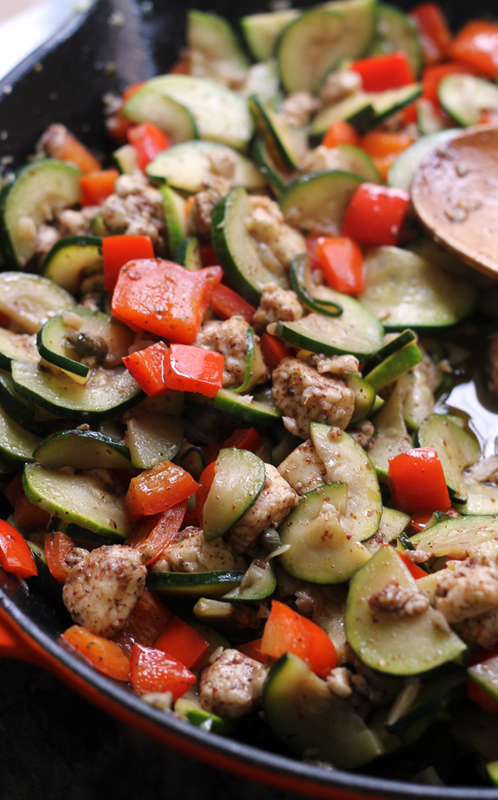 Add the zucchini slices and bell peppers to the pan along with a pinch of salt, sumac, and za'atar. Saute for 5-6 minutes, or until veggies are softened, stirring frequently. Stir in the capers. In a small bowl, whisk together the ingredients for the dressing until well combined. 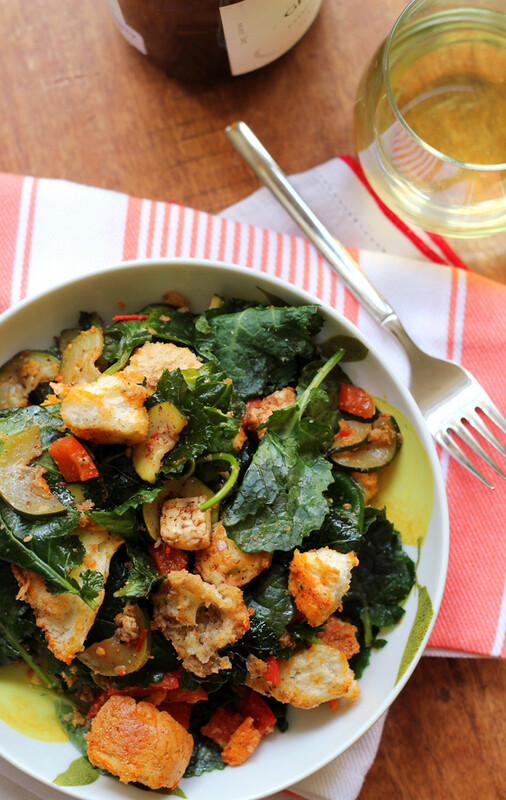 Toss the veggies with the baby kale and bread slices. Toss with the dressing. Season to taste with salt and black pepper. I’ve never thought of adding Middle Eastern flavours to a salad – totally stealing that idea. 😉 It looks so delicious! 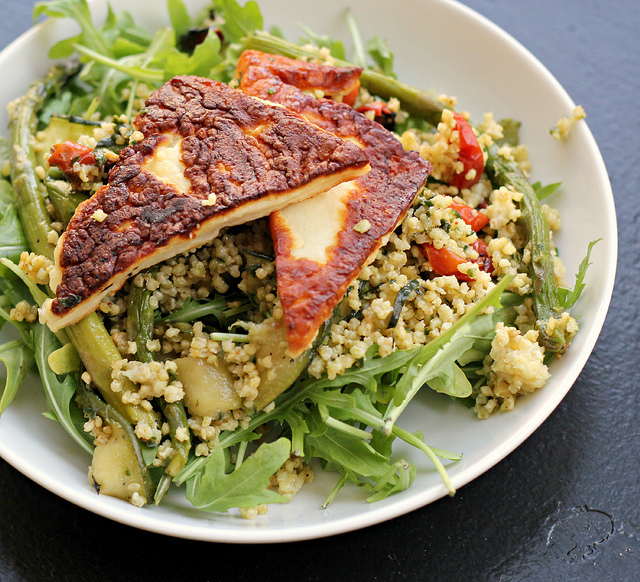 And then there’s the halloumi … oh me oh my! 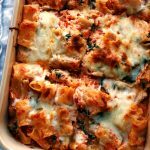 How do you keep coming up with such amazing recipes? This one is brilliant! You had me at halloumi! And ha that damn zucchini just grows like crazy… ahem… not at my apartment! PS We went to Gloria Ferrer on our first trip to Napa and did a champagne tasting. Such a beautiful winery!! Deeelicious! I love how creative you are with veggies in season. I’m going to need to try this one, for sure! I totally want! My garden goodies are doing well and growing and I can’t wait to use them for dishes like this! You make the best salads! I’m going to check out the contest. Thanks for the info! Our zucchini in the garden get sometimes so huge that we end up using only a 1/3 of the veggie, only to freeze the rest. 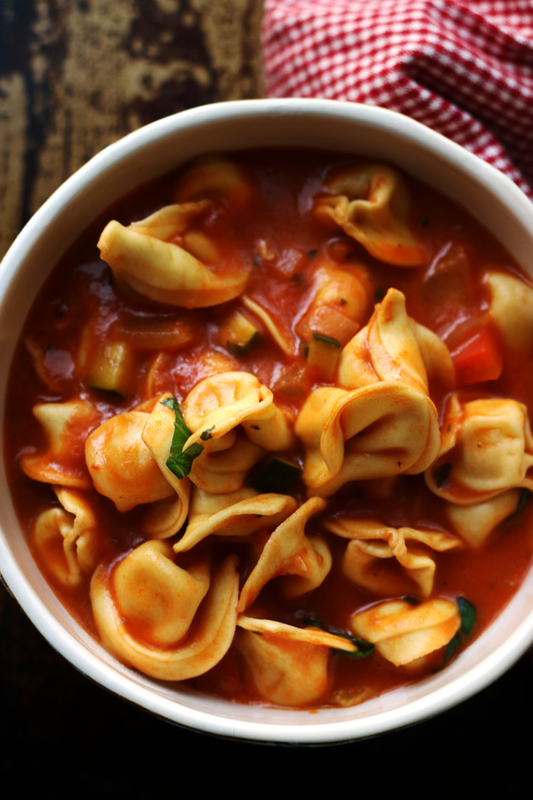 I can imagine making this with halloumi during harvest time. You have some serious talent when it comes to salad! Love how creative you are with all the flavors. This one looks delicious! what a great salad! yum! I am so in love with this dish. I haven’t had zucchini in a bit. But this is definitely making me want to go to the market today and purchase some. I must try this. Thanks for always inspiring great dishes at my house. I must look out for some halloumi! The bread salad looks scrumptious. It has been forever since I’ve had a good Panzanella salad! 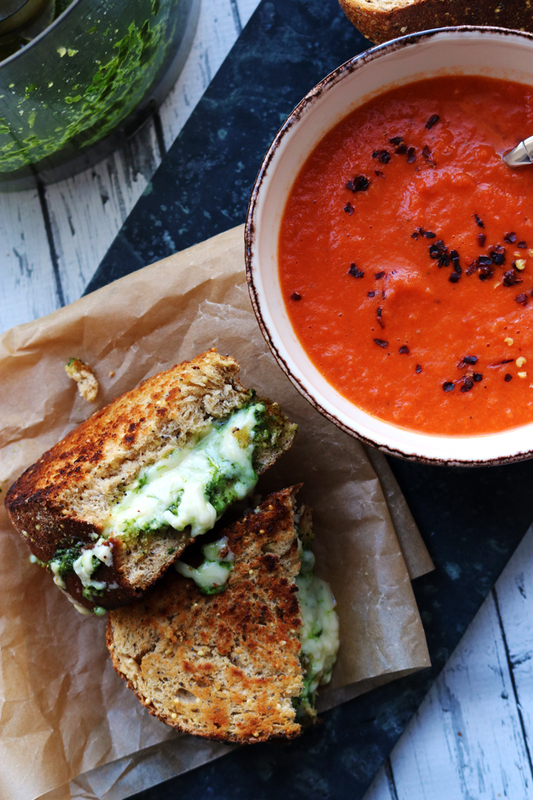 This sound so good, especially with the halloumi. Oh yum!!! 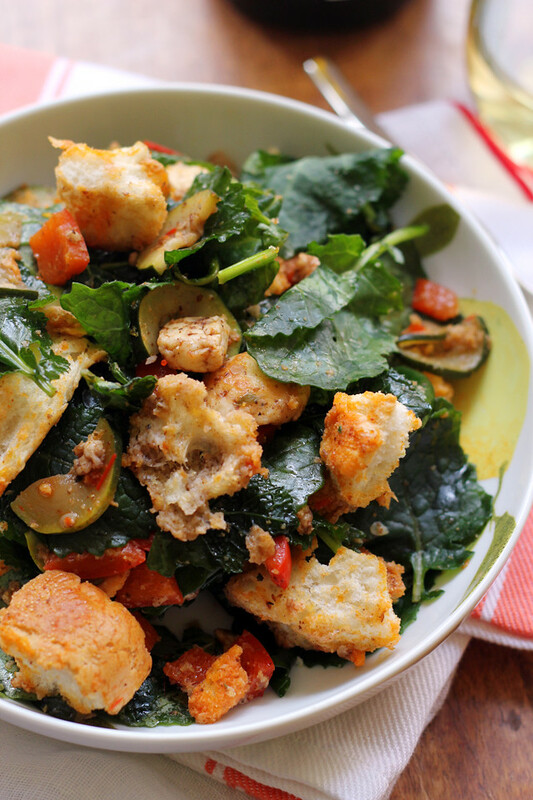 Panzanella salad is SO Fun!! Perf for a summery BBQ!! Thanks for sharing!! So jealous of everyone’s zucchini growing stories. I haven’t had much success. So I just buy it – whatever works. Love me a panzanella salad! I’m having a bit of a thing for zucchini right now too. I must have missed it all winter! And, yes please, to salads for the summer. Love these flavors! I would’ve eaten this even if you didn’t add any spices to it – though with that sumac and za’atar, it would be so hard to not inhale this! Bring on the summer food! This looks so good! I think it’s funny how we’re always on the same page. We’re having zucchini with dinner tonight. Second time in a week! OMG yes to ALL of the above, sooooo good! 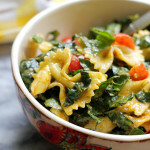 Love the harissa in the dressing – Joanne – would give it a wonderful blast of heat! Loving the harissa and champagne vinegar in your dressing + totallly need to get on the halloumi train because I’ve yet to try it but it looks heavenly! I am so ready to start eating like it is summer. But, where is summer weather? The weather is crazy here at the moment. Halloumi is my second favourite cheese (after feta, obviously). I love how squeaky it is. 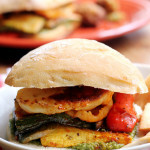 Halloumi is on my list of foods I want to cook that I’ve never had before! After seeing this, I’m moving it up to the very top of said list (sorry, kohlrahbi!). Haloumi cheese in a panzanella. Why didn’t I think of that! 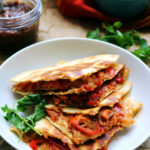 Oh adding Harissa is such a great idea!!! I crave salads so much in this warmer weather! This looks delicious!! Now this is my kind of salad! We’re picking up our first CSA share of the year tomorrow (yay!) and I think I’ll have most of the ingredients to make this beautiful thing (yay part 2)! Absolutely delicious looking. You design such nummy salads! It’s been ages since I’ve had any zucchini! 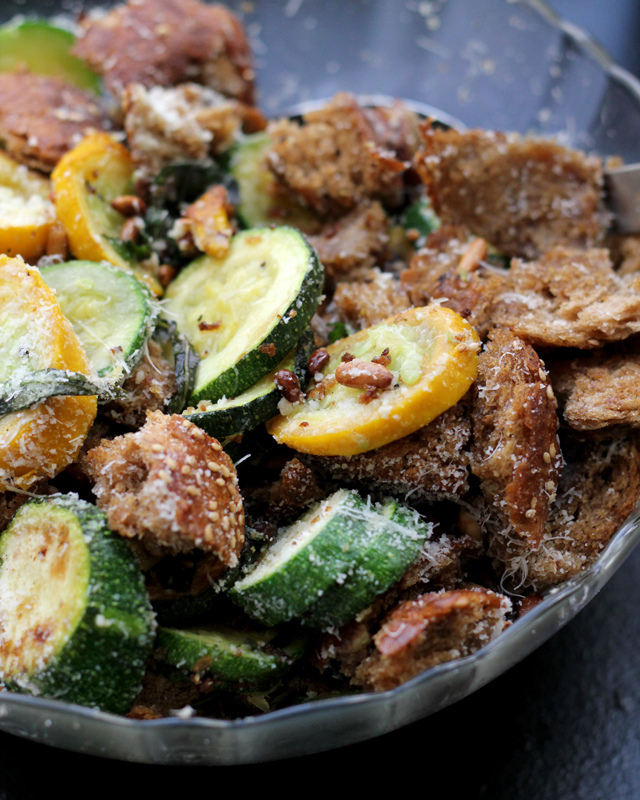 You had me at zucchini and then again with fried cheese! I want to eat this on a patio and maybe even swim in it and make it all mine. I love panzanella and I’m SO glad I don’t have to wait on garden tomatoes to make this winner!!! Yes, I could see myself sitting on a patio with this salad and a glass of wine. Sounds delicious. Yum!! I feel like I am never ready for the summer, salad-wise. This should do it! I love seeing different variations of panzanella salad and yours looks awesome, Joanne!! I’ve never grown my own zucchini before, but I have heard they can get pretty big! Maybe I should start this year, although I’m not sure how big they would get down here in the desert! Either way, this salad looks so good! Totally agree! Bring on all the summer veggies! 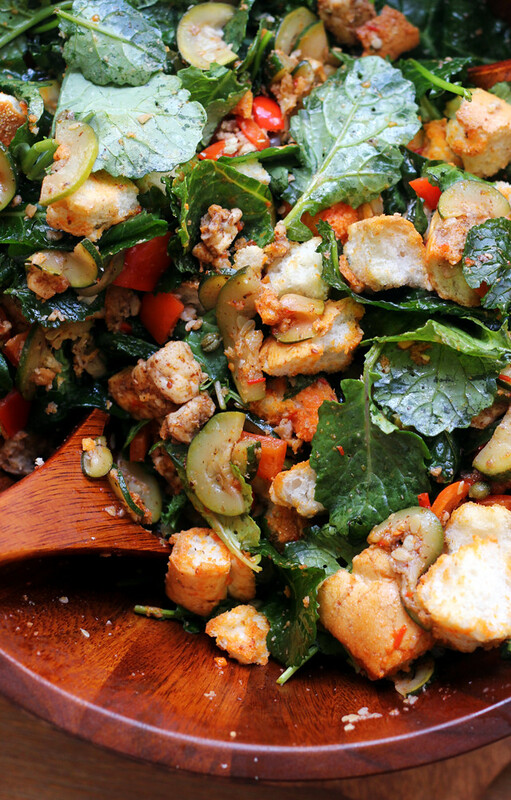 Love all the yummy goodies you packed into this panzanella salad! It looks incredible and I love the halloumi in here! 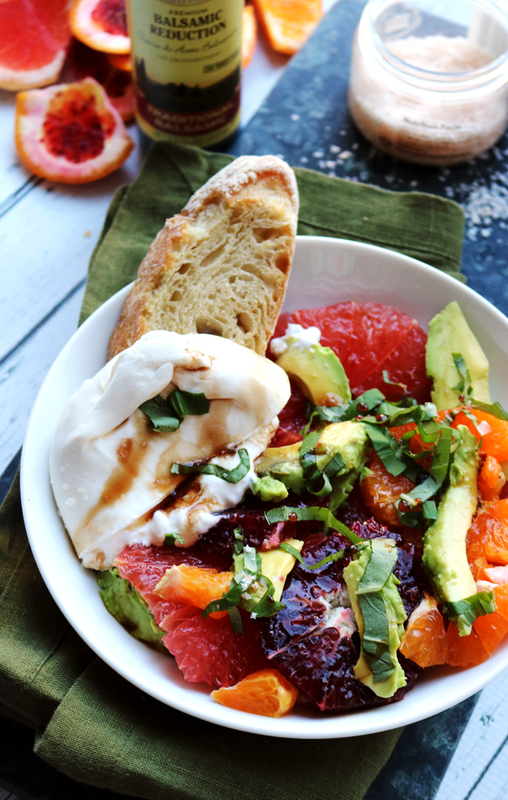 Love everything in this salad- bravo! Food just tastes better when you are eating it outdoors! 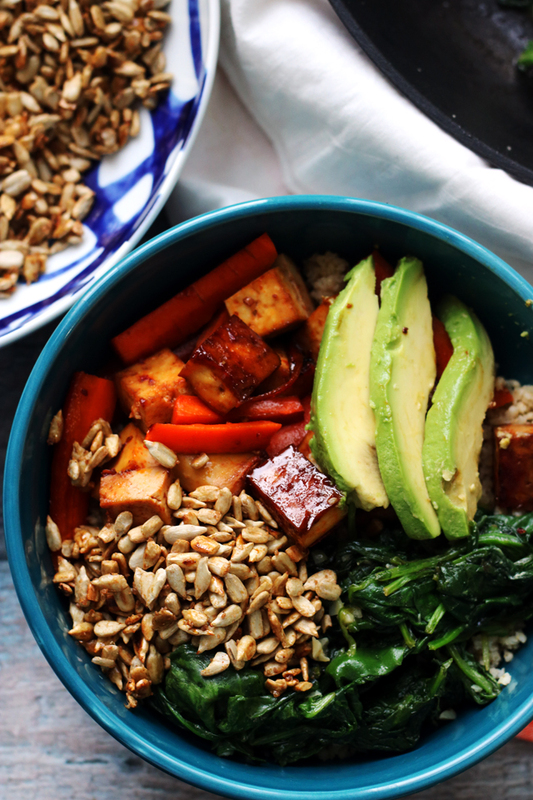 Love this salad and all of the flavors! You know that I still haven’t grilled halloumi yet?! 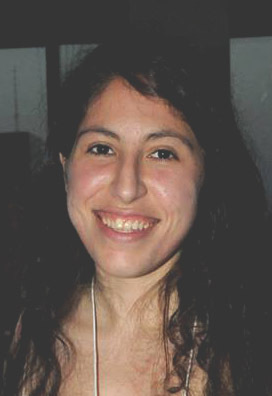 I love you and your panzanellas, Joanne! Added to the hope-to-make-soon list for sure. So, this weekend I made zucchini/summers quash/eggplant with zaatar vinaigrette and my older kid literally had 4 helpings. I’m preeeeetty sure that adding cheese AND bread to something similar might push it to 6.